Just how important is breathing for your health? PART 1. Just how important is breathing? Sounds like a silly question I know, obviously it’s very important, if we don’t breath we can’t live. Seems pretty simple eh? HOWEVER…….although the primary function of breathing is to provide the cells in your body with the oxygen they need to produce energy, it also has several other positive effects that can make a significant contribution and/or improvement to your health. This dome shaped muscle flattens out when it contracts, thereby increasing the volume within the chest cavity and reducing the pressure within it. Hence air is inhaled into the lungs. 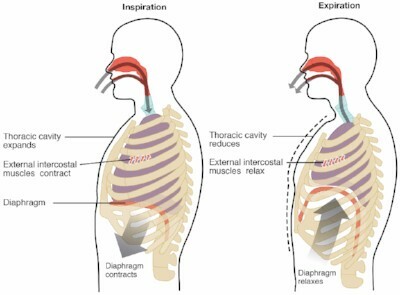 When the diaphragm relaxes the natural elasticity within the rib cage and the contraction of the muscles between the ribs reduce the volume of the chest cavity, increasing the pressure within the lungs causing you to exhale and voila; we have one full breath. How else does it affect your health? Now, this is how air gets in and out of your lungs, what is often overlooked is how this process affects other parts of the body. Allow me to explain. 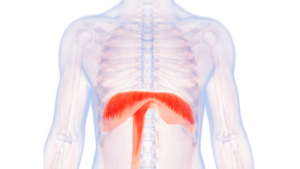 As your diaphragm contracts and descend down into the abdomen, while your chest volume increases and lung pressure decreases your intra-abdominal volume decreases and the pressure increases. Whilst this seems like an obvious by product of inhalation, it actually promotes the flow of blood back to the heart. All the blood from your legs and abdomen i.e. 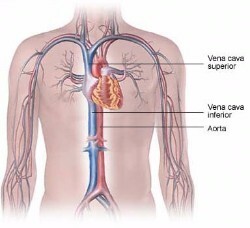 MOST of the 8 or 9 pints of blood in your body returns to the heart via a single vein called the inferior vena cava. As blood within the veins in the body is not pressurised, blood flow in these vessels relies heavily on assistance from muscular contraction and pressure changes. In this case, the decreased pressure in the chest and increased pressure in the abdomen causes a pumping effect on the blood in the inferior vena cava sending it back to the heart to be re-oxygenated in the lungs and then back round the rest of the body, supplying the body with the oxygen it needs. This is super important because most of the time the venous blood in the legs and abdomen is constantly trying to fight against gravity and this pumping effect from contraction of the diaphragm is essential to ensure good circulation and good circulation is essential to just about every aspect of your health. So as you can see, breathing does more than just fill your lungs with air. But this is only half of the story. Many of us (myself included) probably do not use our diaphragms or breath as efficiently as we could and/or should. Many of us, for various reasons overuse our accessory breathing muscles and underuse the diaphragm, which is fine for short periods and when extra effort is required, but over prolonged periods of time can lead to pain and dysfunction and thereby an overall reduction in health. Check back for PART 2 next week to find out why this may be the case and what you can do about it!